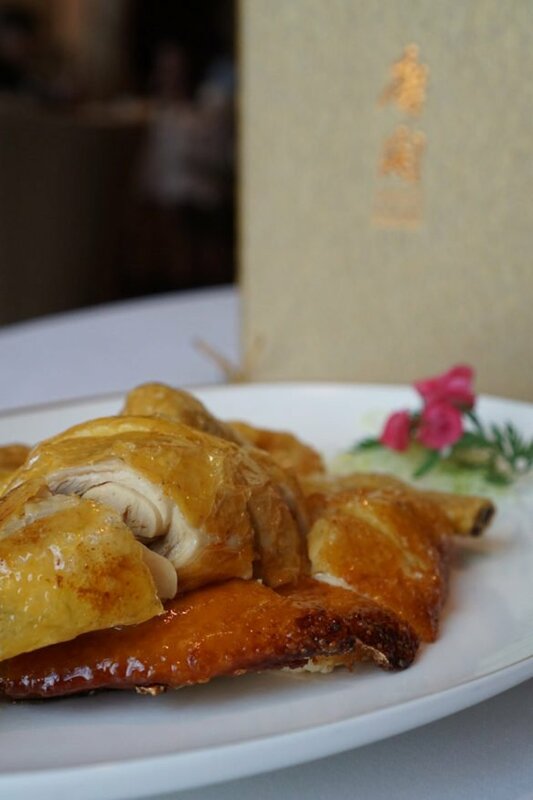 There are only five three-starred Cantonese restaurants in the world, and we’re lucky enough to that with our visit to T’ang Court, we’re just one away from the finish line. (The others are The Eight and Jade Dragon (Macau), Le Palais in Taipei and Lung King Heen (Hong Kong)). 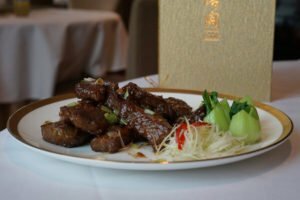 We’re starting to know what to expect from this exclusive breed: very classic Cantonese cuisine with a focus on enhancing the subtle flavours of the very best produce, and somewhat dated decor. Unsurprisingly, T’ang Court doesn’t stray far from this winning formula. It’s been a Hong Kong institution for 30 years (in fact, it celebrates it’s 30th anniversary this year) and amazingly still boasts the same head chef and maitre d’. It also boasts customers who are still returning to its familiar walls, some guests having passed their love for T’ang Court down through generations. We’ll start this one off with the disclaimer that due to our seafood allergy, we won’t be trodding down the path most travelled, rather wandering off into some side streets to taste some less oft-reviewed dishes. First up is one of our all-time favourite Cantonese dishes, BBQ pork. 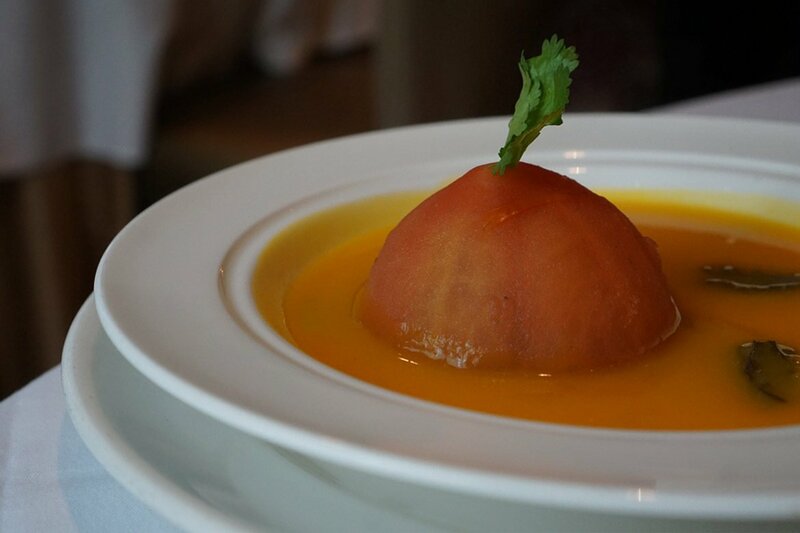 T’ang Court’s version is superbly fatty, juicy, sticky and flavourful. We can’t fault the execution of this classic. Next is a vegetarian dish, Stir-fried mixed mushrooms and fungus with black truffle paste in tomato with pumpkin dressing. 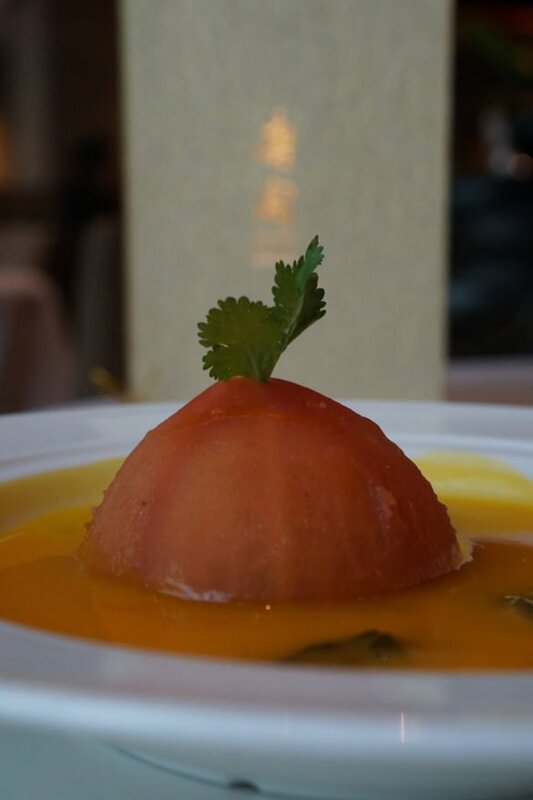 Essentially, it’s a hollowed out tomato filled with mushrooms in a pumpkin soup – it’s a well-prepared dish but for us, the flavours are a touch too subtle, nothing that can’t be fixed with a large dollop of T’ang Court’s delicious chili paste, however. Perhaps a tad uncouth, but we just needed to turn this dish up a notch. We return to the meatier side of the menu again next, the Crispy salty chicken knocking it out of the park. 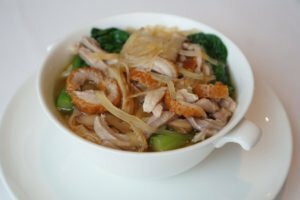 We do our best to tackle boned joints of chicken with chopsticks, devouring the uber crispy skin and succulent flesh off the bones with much aplomb, and mostly without incident (we did vacuum up a few bone fragments in the process – clearly, more practice is needed). We’re never one to say no to Wagyu, so the next course of Stir-fried diced Japanese Wagyu with spring onion and wasabi is music to our ears (and of course, tastebuds). 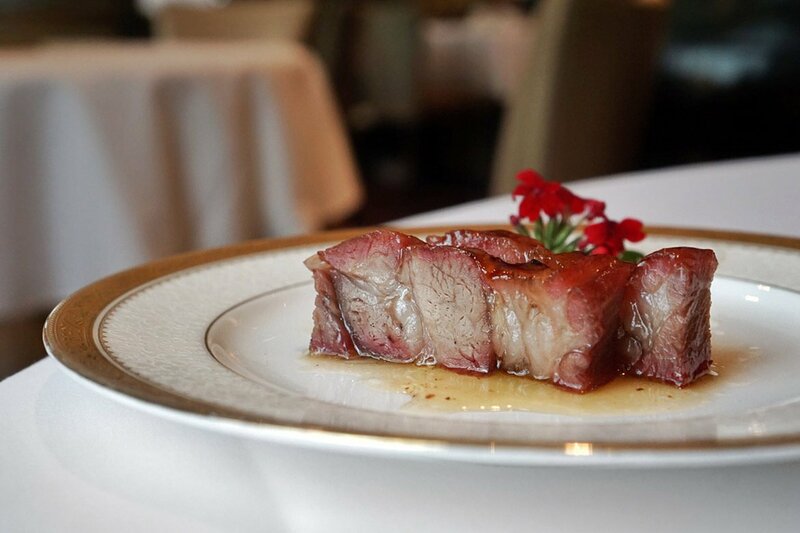 The large chunks of Wagyu are expertly cooked – juicy, tender and unctuously marbled. It’s one of the most enjoyable Wagyu dishes we’ve had in recent memory (living in Dubai, we eat a lot of Wagyu), and unlike the Akira Back version, we can clearly taste the wasabi here as it cuts nicely through the fattiness of the meat. With pork, chicken and beef ticked off the list, it’s hardly surprising that duck is up next. Sadly, however, our run of spectacular carnivorous dishes has come to an end, with the extremely mild flavoured Noodle with shredded duck and preserved mustard root in soup is just far too mildly flavoured to warrant the caloric expenditure. We do however slurp up the broth, figuring that it might help cure what currently ails us (a decent whack of the flu). 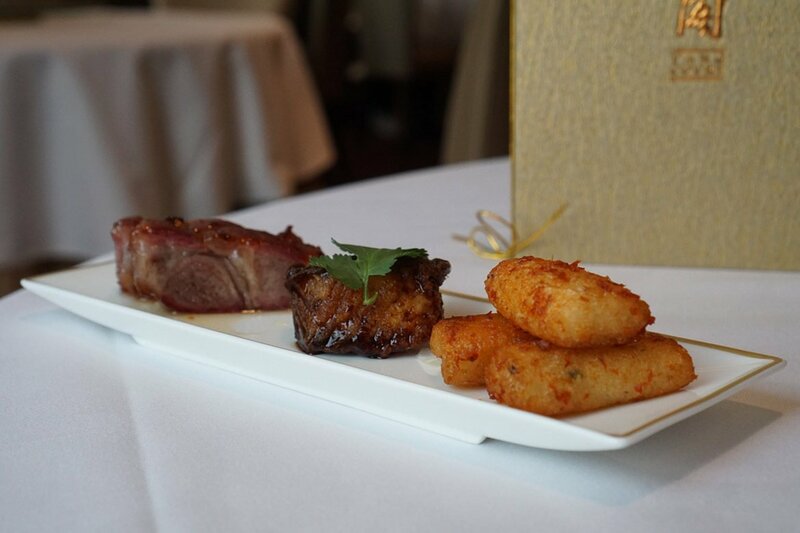 With main courses done and dusted, two dessert courses lie ahead of us in the tasting menu. 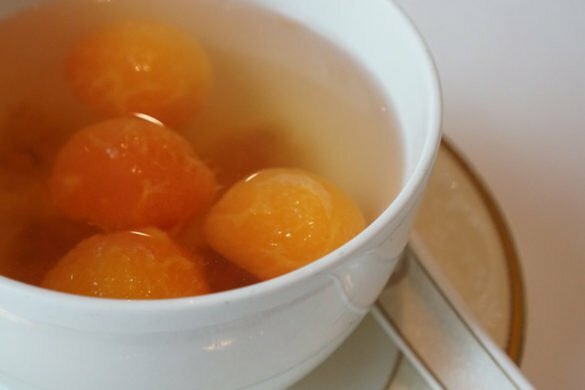 The Double-boiled papaya with peach gum and rock sugar is unlike any dessert we’ve ever encountered. 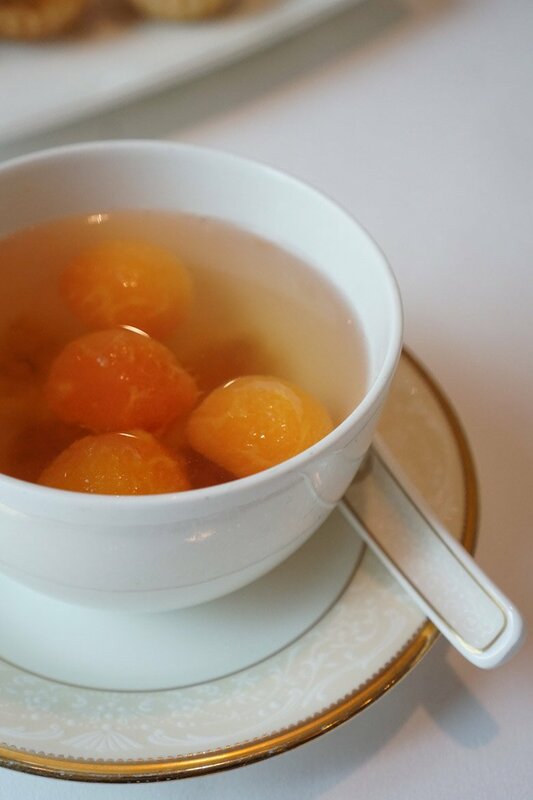 It’s challenging, perplexing and intriguing all at once, and while we’re not that into the papaya balls and the unusually-textured peach gum (it’s good for your skin apparently, but we still couldn’t force it down), the soup was indeed beautifully fruity and sweet. 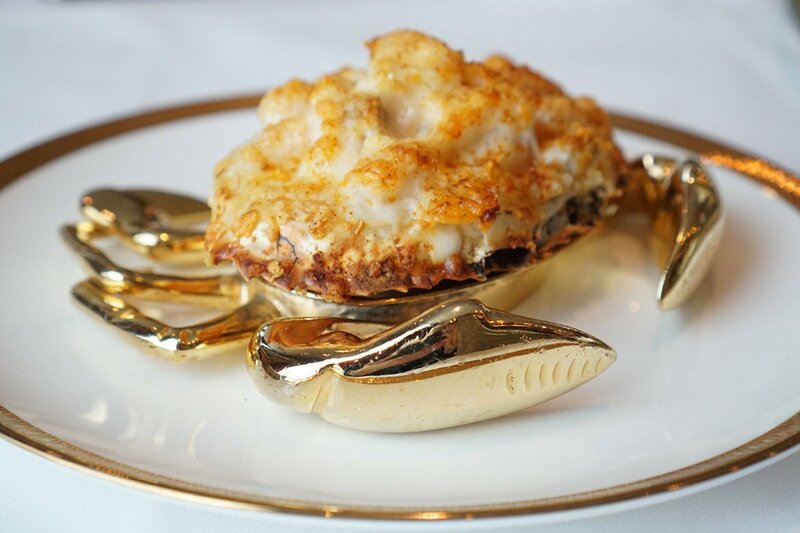 Quite the unusual dish (for an out of towner, anyway). 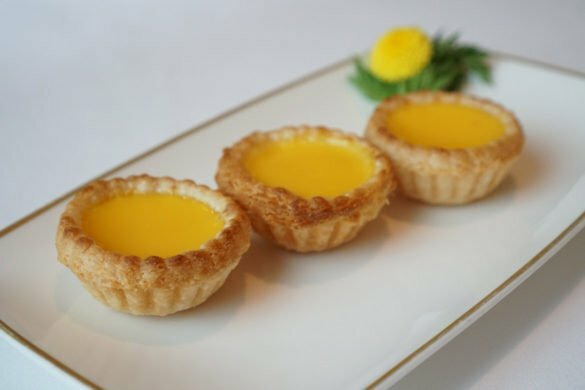 The small, Freshly baked egg tart that follows is light and flaky with a dense eggy centre, feeling perfectly appropriate given our location. 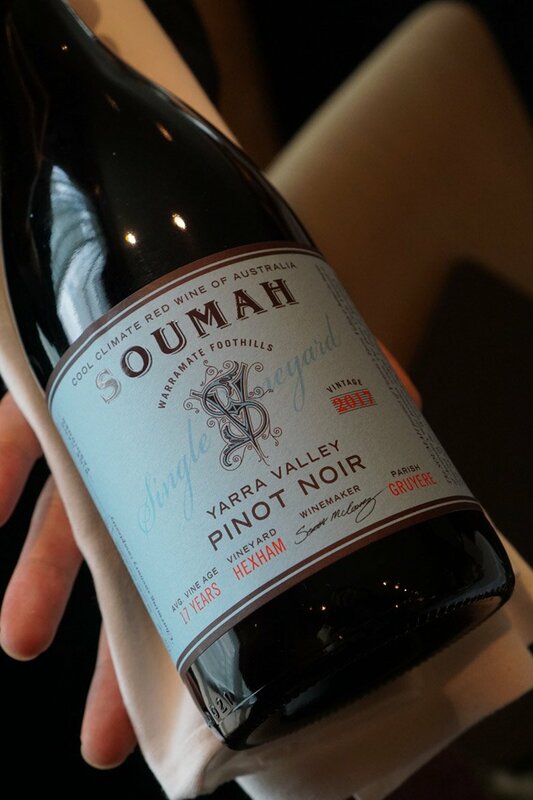 T’ang court also boasts a well-considered wine list that showcases some gems you won’t see every day in their by-the-glass list, something for which we are always thankful. 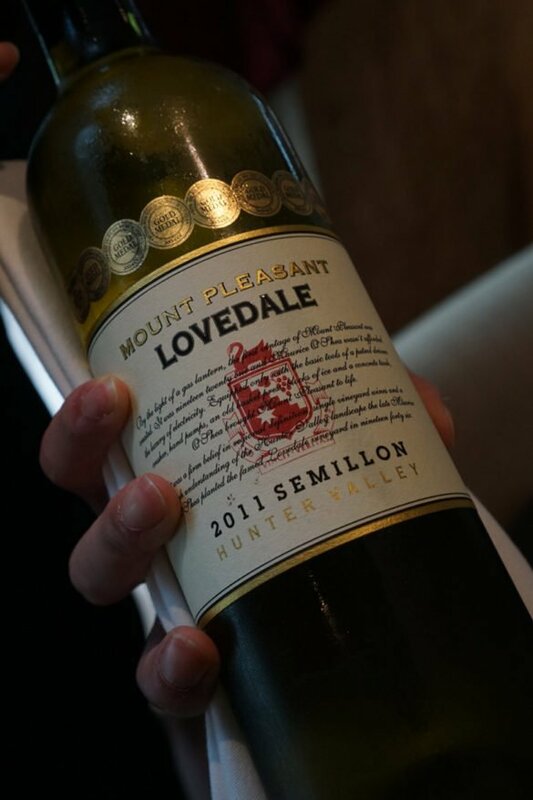 Our meal was paired with the Mount Pleasant Lovedale Sémillon 2011 from Hunter Valley, Yarra Valley’s 2017 Soumah Pinot Noir and the Lanson White Label N.V. Dry Sec (the Langham has an extensive partnership with the house). 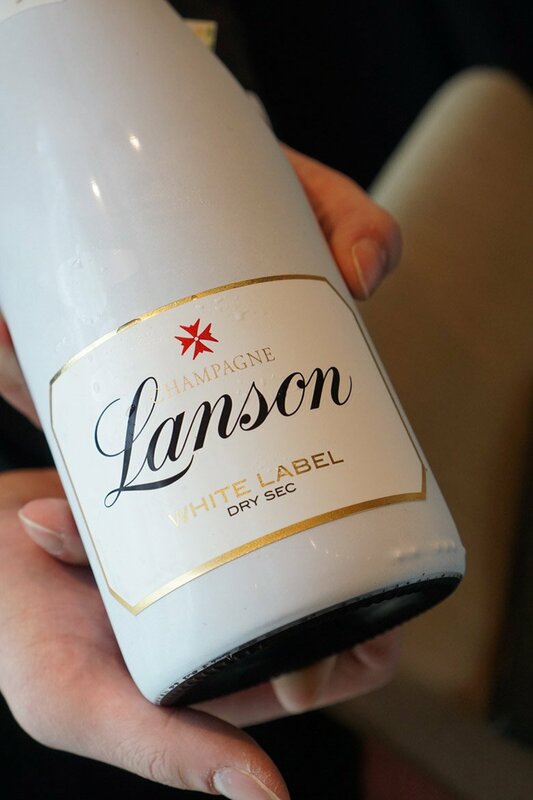 We enjoyed all options and they were all something we hadn’t tasted before – fab! How do we feel it stacks up against the competition? While the decor doesn’t exactly excite us (and we’d like to see an ironed table cloth given its three stars), we’d definitely return – but we think we’d do a la carte next time to pick the dishes that suit our tastebuds more – those with a little more saltiness and flavour as for us the more subtle dishes just didn’t excite. We don’t see T’ang Court losing it’s three stars (or it’s extensive following) any time soon – perhaps we’ll have to return to take their dim sum for a spin. 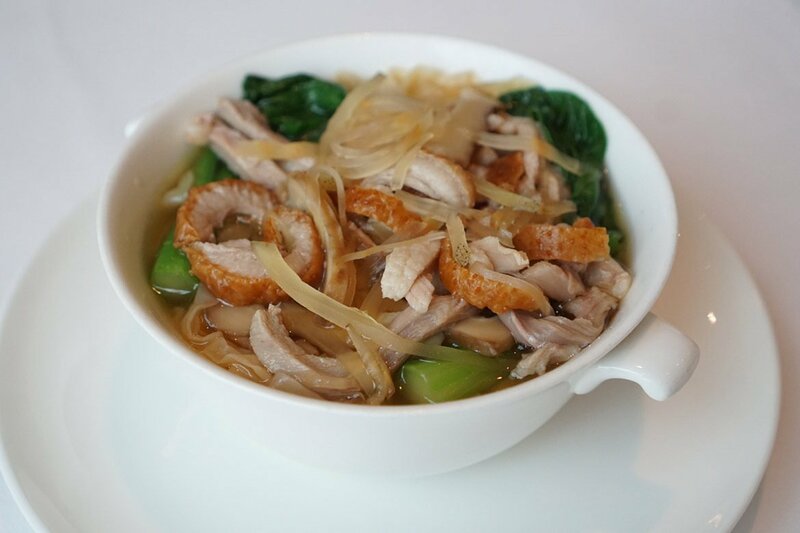 What’s your favourite spot for Cantonese cuisine in Hong Kong? Fancy Spending a Night in the World’s Tallest Building?